"...Guests can dig into a multicourse dinner (with their hands; no silverware) while watching athletic, armor-clad 'knights' wage mock battles on galloping horses at this huge family-oriented castle/restaurant/arena (it seats 1,450 people). Everyone receives a color-coded crown that corresponds to one of the jousting horsemen and then cheers for that knight. During the dinner and show, there are also realistic swordfights and medieval games (based on documentation dating to the 11th Century). Guests get vegetable soup, garlic bread, roasted chicken, spare ribs, herb-basted potato and pastries for dinner. A cash bar is available throughout the show." "...11th century jousting, sword-fighting and knights on horseback provide the entertainment as guests feast on a four-course banquet. Also, displays of medieval artifacts." "...And so, Gentle Reader, here endeth the adventure. Medieval Times doth provide fair sustenance to the masses, and delectable victuals for them what detesteth the flesh of slain creatures. Yea, hear me and know that spectacle and gallantry aboundeth in the realm of King Phillipe, and the feast for the eyes shall overwhelmeth thy spirit with majestic Andulusians and epic warriors of days anon." 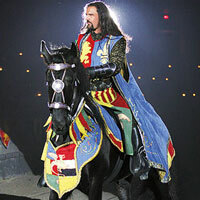 "...The show is called �Medieval Times� and it is a canny mix of jousting, equestrian exhibitions, and fighting as imagined at a European royal court in the Middle Ages. The spectators not only watch men dressed as medieval knights demonstrate horsemanship as well as engage in lethal combat, the patrons get to dine on a meal centering on a gigantic piece of broiled chicken."